Back in 1962, the world assumed that US President Kennedy had won the Cuban missile crisis simply by pushing Russia so far as to remove the weapons from Cuba’s soil. In fact, as we later learned, the result was a compromise between the world’s two superpowers of that time. Whereas Russia did indeed remove their missiles (aimed at the US) from Cuba, the Americans in turn removed their own weapons from Turkish soil, the ones that were directly aimed at the Kremlin. With all that’s been happening in Europe in the past decade, Russian President Vladimir Putin needs to start looking to the great European plain west of him again as the countries which used to fall under the so-called Iron Curtain (as former UK Prime Minister Winston Churchill called it) have now mostly turned against him. Former allies like Poland or the Baltic states (Estonia, Lithuania and Latvia) are now eagerly looking forward to the promised delivery of US missiles (said to be for their defense, whilst Russia sees them as offensive weapons placed in their old backyard). During his meeting with National Security Advisor Mr John Bolton this week (where he agreed to meet President Donald Trump in Paris next month) Russian leader Vladimir Putin therefore jokingly referred to the Great Seal of the United States, which includes a bald eagle holding a bundle of 13 arrows in one talon and an olive branch with 13 olives in another, as having turned to a single side. "I have a question: Has your eagle picked all the olives and only has arrows left?" Putin asked. He in fact referred to the harsh stance the US military seems ready to make in Europe with the delivery of said new weapons. 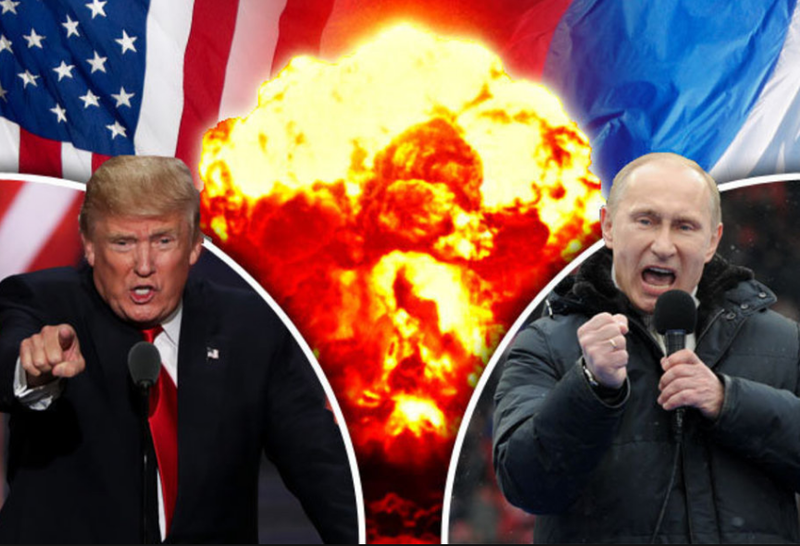 It comes as the US claims Russia has violated the 1987 Intermediate-Range Nuclear Forces (INF) treaty and plans to withdraw from it. The timing is peculiar as Nato is about to begin its largest military exercise since the Cold War, an operation that will involve all 29 members (as well as Finland and Sweden). Mr Putin therefore once again reminded his US counterpart that it was "very dangerous" to dismantle a global arms control system and added: "There would be nothing left except an arms race." If so, Russia's response would be "very quick and effective." "If the US do end up pulling out of the INF treaty, then the most important question is what will they do with the missiles that will reappear again." "If they are supplied to Europe, then of course we will have to respond in kind, and the European countries that agree to this - if things come to this - should understand that they will be subjecting their own territory to the threat of a possible retaliatory strike." We have been giving out all our olives to 3rd world countries for years! All we get in return is mobs of violent migrants that hate America but want to come here none the less??? No, we have not given olives, we have a deep state that has given, drones, bombs and invasions looking for falsified WMDS, the toppling of legal foreign governments, Arab springs, fast and furious scandals, and poppy fields of millions of dollars used to fund the destruction of our own nation. That's just a scratch on the surface. Money mongers, control mongers, and war mongers. That's what the world's deep state and puppets leaders have offered. Death and destruction that knew no bounds, and has evolved into a communist indoctrinated education system combined with the perversion of all things natural, social, and the scientific. May God heal our nation and the world and bring justice on those responsible. Bu bu but, the dims say Putin & Trump are in cahoots with each other?? ?